On May 6, 2019, we will have our annual kick-off of the nineteenth NRCA Golf & Tennis Classic. This event continues to provide school funding for wonderful additions like a new Elementary Playground and a state-of-the-art Mondo playing surface for the Tennis Complex this summer as well as other future projects. What can you do to support and serve? Each year, we look for four companies to be the Event Sponsors ($5000). Event Sponsors are posted on the banners over the school entrance ways and the school website during the month of April. This is our way to express our appreciation for their support and to promote their business. Event Sponsors may also have a foursome of golfers play as a corporate team on their behalf at no additional cost. Also, Event Sponsors become members of the Superintendent Club where they receive play tickets for the fall and spring productions and an invitation to our Donor Appreciation Dinners. 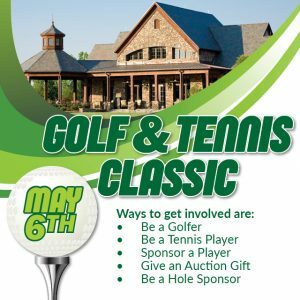 We need 72 golfers and 24 tennis players. We will be recruiting players after the first of the year for this exciting event. We encourage each golfer to ask friends and/or businesses to support them in raising $1000 per player. Tennis players pay $100 to play. Many golfers actually gift the $1000, some give and raise funds, and some raise all their support. Many times, businessmen will ask their vendors to support them. The player receives a wonderful afternoon of golf with prizes on every hole and receives a prize bag full of items like shirts, caps, balls, coupons, and much more. Angus Barn provides Ribs on the Green throughout the afternoon. At the end of the day, there is a lovely dinner at the Hasentree Clubhouse, which your family can attend. There is also an auction and we hear from our Honorary Chairs who are NRCA Alumni. If players gift their $1000, they become members of the Superintendent Club, receive tickets to the fall and spring play productions the next year and an invitation to our Donors Appreciation Dinners. Perhaps you do not play golf but seek to support the school. You can sponsor a golfer to help them raise their $1000 goal. There will be a point where a list of those playing will be posted or you can simply give a gift and we can allot it towards one of the golfers who needs assistance. You can promote your business by being a sponsor of one of the eighteen holes at the golf course. The cost is $250.00. A lovely sign will be placed on the hole with your company name and/or logo. The rest of the week, the signs are displayed at the exit of the school. You can also have a flyer and/or coupon in the gift bags for golfers and tennis players. We also have options to sponsor Hole-In-One Events ($500), the Practice Range ($500), and the $10,000 Beat the Clock Competition ($500). Each year, we have an online auction with items provided by parents and businesses that are auctioned online during the month of April. Auction donors can provide flyers of their business that go in the gift bag for each golfer as a means of advertisement. As for this year’s giving, it will go towards installing a new Elementary Playground this summer and giving a portion to pay for the new Mondo playing surface for the Knights Tennis Stadium. As funds allow, we will continue to support the tuition assistance program, bus funds, lower elementary iPads, technology infrastructure, and the Founder’s Day Celebration.